Re3dTech makes your businesses parts stronger, lighter, cheaper & faster. This is a picture of the future of American manufacturing. At Re3dTech, we believe that 3d printing will repatriate and revitalize our manufacturing industry. By moving from mass production to mass customization, Re3dTech will play a major role in providing industrial grade 3d printing services, access and capacity at the point of need. Helping our customers move their manufacturing from overseas centralized production centers, to local on-demand manufacturing and parts production, resulting in no warehousing needs. Co-Founders, James Teuber and Russell Beck will bring their years of business and manufacturing experience to help pave a path to the future of manufacturing for our customers. Furthermore, by using the latest 3d printing technologies, Re3dTech is moving past prototyping to true end use parts production. Let us show you what we can do for you, request a quote. 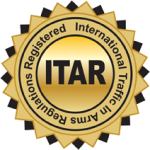 All manufacturers, exporters, and brokers of defense articles, related technical data and defense services as defined on the United States Munitions List (Part 121 of the ITAR) (PDF, 7MB) are required to register with the Directorate of Defense Trade Controls (DDTC). Registration is primarily a means to provide the U.S. Government with necessary information on who is involved in certain manufacturing, exporting and brokering activities. Registration does not confer any export rights or privileges, but is a precondition for the issuance of any license or other approval for export. Once an entity has properly registered with DDTC, a unique registration code will be assigned to the registrant. The DDTC registration code consist of a letter prefix, M (assigned to a manufacturer and/or exporter) or K (assigned to a broker), followed by four or five digits (e.g. K-1234 or M 12345). The code is proprietary to the registrant and should be handled as such. Company registration codes should not be posted online or given out freely to the public.